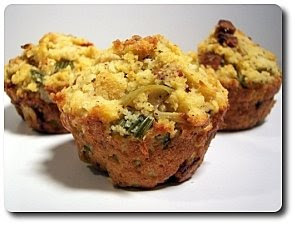 Zucchini Nut Muffins... and a new look! As you can see, we are testing out some changes to the website. All seems to be smooth for now, but if you happen to see any issues, please don't hesitate to send us a note! We hope you enjoy the new look! We bring this holiday week to a close with 12 recipes, 9 of them being new - sticking with the new ones, our favorites this time were the Spice-Brined Turkey with Cider Pan Gravy, Chocolate Cherry Brownie Bites and that Turkey Alfredo Pizza. With all of the leftovers from Thanksgiving, I felt the urge to get the oven goin' again for a snack... hey, I can't help it! 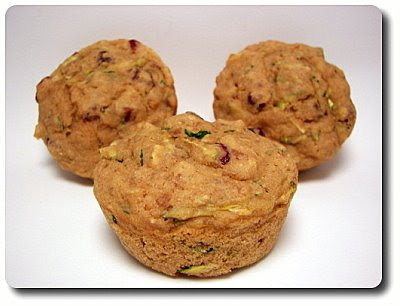 Jeff made a passing comment earlier in the week that is had been awhile since we've made muffins... so I made a mental note and decided to try these Zucchini Nut Muffins today. 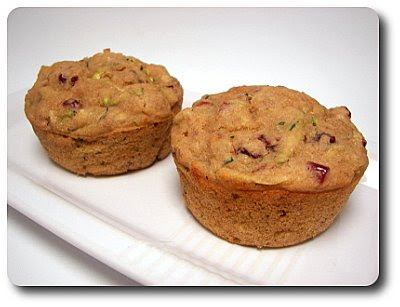 Filled with shreds of juicy zucchini, these healthy muffins are decidedly moist with a well-developed flavor thanks to a variety of ingredients. I used our usual combo of all-purpose and whole-wheat pastry flour, but you could use completely all-purpose or switch the pastry flour with white whole-wheat flour if you happen to have it on hand. For a nutty richness, toasted chopped walnuts are thrown into the mix, along with chewy pieces of dried cherries for a sweet-tart bite. Always bringing an intoxicating aroma, we also added a few shakes from our favorite Vietnamese cinnamon to ratchet up the flavor. Rather than using white granulated sugar, we sweetened these muffins with complex pure maple syrup as part of the wet ingredients. While we did add a bit of canola oil to give the muffins a pleasant texture and mouth feel, we did use a larger amount of applesauce to keep the fat down - this duo also played into their moistness. Since these muffins didn't have any eggs in them, I found the texture to be a little on the heavier side. The baking powder did do its job, giving them some lift and rise, but they didn't seem to be as light as muffins we normally make. Even so, the taste made that a moot point for us and we didn't mind. 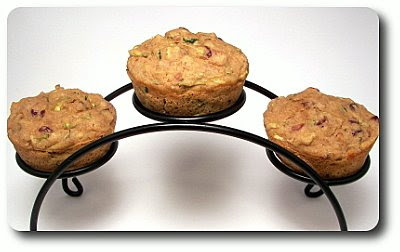 Since we used soy milk in these, I believe the muffins can be considered vegan, but I'm not an expert on that. If you don't have or like soy milk though, don't let that deter you... regular milk would work just fine. Pardon the dust! We are trying to freshen up the blog a bit. If you come across any problems, please let us know! 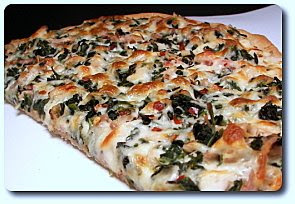 Use up those turkey leftovers in pizza! You got a sneak peek of our dessert last night... did you figure it out? 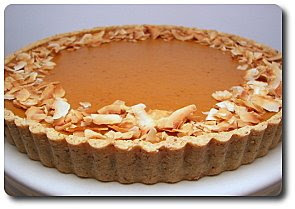 Infusing a little Caribbean flare into pumpkin pie, we made this Pumpkin Coconut Tart for us to nosh on! Besides reading like we would enjoy it, one of the other reasons I chose to make this was the make-ahead factor. I actually got the crust out of the way on Wednesday, so the oven would have one less thing to try and do on the big day. No need to fear this tart crust - all you need to do is dump a bunch of flour, a few toasted almonds and a hearty pinch of sugar into a food processor and let it do all the work. When the almonds were finely ground, cubes of cold butter are tossed in, followed up a four dollops of cream cheese. No icy water or extra liquid necessary! It won't (and shouldn't) come together in a ball - it will be fairly crumbly... but if you squeeze it together in your hand, it'll stick together. Scooped into a tart pan, the mixture is firmly pressed over the bottom and up the sides. Since this crust will be in the oven twice, the first time in you'll want to leave it just long enough to set it and before it gains any color. Once cooled completely, you can keep it, well wrapped, in the refrigerator for up to three days before continuing on. 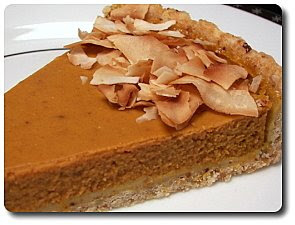 Now, instead of using regular or evaporated milk in this pumpkin filling, we used coconut milk for a tropical note. What goes well with coconut? Rum, of course! So, a glug or two is added, along with eggs to bind and aromatic cinnamon, ginger and cloves to spice it up. Take it out when the edges are firm, but the center is still somewhat soft - it will continue to firm up as it cools. You can serve this either at room temperature or chilled, depending on your preference. 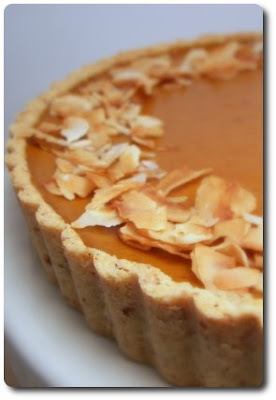 To match up with the coconut, we dropped toasted coconut chips around the edge - this isn't necessary, but it helps people know what this is not your ordinary pumpkin dessert. If you can't find the chips, flaked coconut would work just as well. 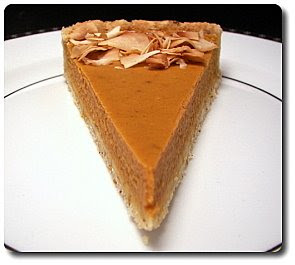 The nutty crust was light, yet firm enough that you could pick up a slice without it falling apart. Dark orange in color, the filling was so soft and velvety as it rolled around on my tongue - it almost seemed like it shouldn't hold its shape being so creamy, but we got very clean slices! If you use homemade mashed pumpkin, be sure to give it a whirl in the food processor so it is ultra smooth before using it. I was happy to find it didn't scream "I'm made with coconut milk! ", but what the milk did was give the filling extra body that sighed with subtle coconut in each bite. Jeff suggested that turkey sandwiches would be fine for dinner tonight, rather than our Friday Pizza Night, but I figured a pizza would be a great vehicle for the leftover turkey! Since it just takes a quick whirl in the food processor, I threw together our favorite whole-wheat pizza dough to make this Turkey Alfredo Pizza! However, if you are still tired from Thanksgiving or you'd rather not mess with dough, you could certainly use one of those thin pre-baked crusts from the market. Once the crust was all stretched out, I did give it a head start in the oven for just a few minutes. To add a whisper of garlic to the crust, as soon as I slid it off the stone and flipped it over, I rubbed a halved clove of garlic all over the top. 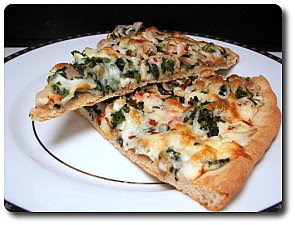 We then smeared a good dose of Alfredo sauce over the partially-baked garlic rubbed crust, followed by a mixture of shredded turkey, thawed frozen spinach and bright lemon juice. Nutty fontina was the cheese of choice and we finished it off with a couple pinches of crushed red pepper for a tingly kick. What a way to start using up those leftovers! We both thought this was fantastic, especially with the thin crust. The layer of that rich sauce underneath was a crazy good base for that meaty topping. 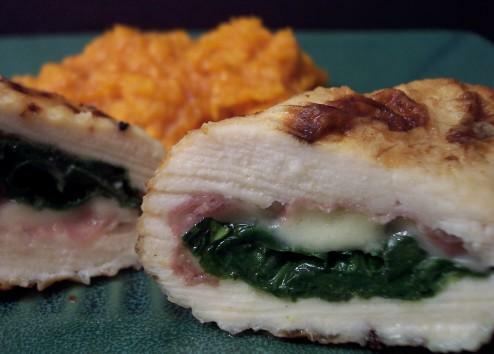 If you want to use a heartier green, you could swap out the spinach for collards instead. We hope everyone is enjoying their day today! We were planning on going down to the farm, but as you heard Gus had a trip to the vet yesterday and we thought we should just have a quiet day around here. Gus is still kind of tired, but he is keeping an eagle eye on the giant turkey! So, let's get to the food! 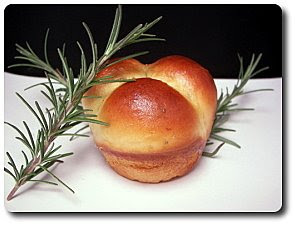 One of the side dishes that Jeff just can't keep his paws off of is those soft Roasted Garlic and Fresh Rosemary Cloverleaf Rolls that I've been making for the past few Thanksgivings. Homemade fresh bread, studded with flecks of fresh fragrant rosemary, oozing with roasted garlic and brushed with melted butter... these tender rolls never last long and I always end up making another batch later in the day just so we have some for leftovers. 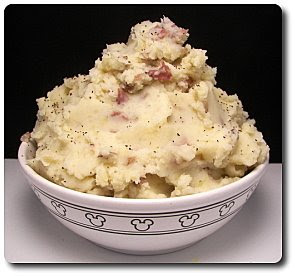 We made a big 'ol batch of mashed taters too - we riced them last year, but we went rustic this time and just smashed up a mess of buttery Yukon Golds and creamy red potatoes. Warmed milk, a few pats of butter and generous amount of fresh ground black pepper later, we had a mile-high mountain of carb heaven! Stuffing? I tried to push a new recipe, but Jeff wouldn't have it - he pleaded to have that Sausage, Apple, and Fennel Corn Bread Dressing we've made for the last two years. While a new recipe would have been nice, I'm really not complaining as it was quite tasty - especially made as individual muffins! On to the turkey... we usually do a smaller version like a whole turkey breast or whatnot, but this year we went all out and prepared our first very large 13 pound whole turkey! Maybe crazy since it is just us two (and well, you know, the pups will be having a small share), but we love leftovers and I've already got plenty of ideas to use up the extra meat. We wanted something a bit different, so we opted to make this Spice-Brined Turkey with Cider Pan Gravy. I loved how the swift brine pushed such an sweet aromatic fragrance throughout the kitchen while we were preparing it. Other than water and salt, the brine is infused with slices of fresh ginger, cloves, cardamom, allspice and cracked black peppercorns. Brought to a boil to dissolve the salt, you'll need to let it cool completely before dunking the turkey in and letting it sit for a day. You'll want to pull the turkey out of the brine, let it drain and pat away the excess liquid about an hour before you want to roast it. To prevent any of the drippings that come off from burning during the first roasting period, a cup of broth is added to the bottom of the pan. You'll want to turn on the light and peek through the door to make sure that there is a slight layer on the bottom while it cooks - if it ever looks too dry, just add a bit more broth. 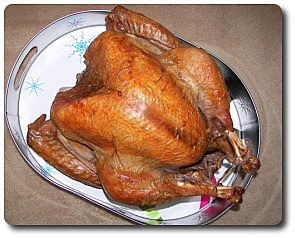 When the turkey was golden and cooked through, we set it aside to let the juices flow back into the meat. This gave us enough time to work on the cider gravy! The crusty bits on the bottom of the roasting pan were scraped up, with a bit of the leftover fat from the cooked turkey being added in, along with a sprinkling of flour. The drippings, sans fat, were poured in with a bit more broth and the tangy apple cider. After just a couple minutes of bubbling, it thickened up well and all that was needed were a few grains of black pepper. A little sweet, but quite savory and rich, Jeff kept himself busy "taste-testing" it just to make sure it was good... he was quite happy with the results! Score 1 for delicious smooth gravy! After what felt like forever for the turkey to rest, we anxiously sliced into the bird to see what was hiding underneath. I hastily peeled off a piece of the white meat (which came off without effort) to see how well we did. We found it to be extraordinarily juicy, tender and very well-seasoned! Jeff admitted he was a little worried it might end up being too salty, but after his bite, he couldn't believe the magic the brine did! Instead of being inundated with the strong spices that the turkey bathed in overnight, they left behind a simply pleasant, faint and sweet character that lifted up the meat's natural flavor. I probably nibbled on more than I would usually put on my plate before I even started getting it filled up! And as we are sweet fiends, we of course did not forget about dessert. However, I haven't had a chance (so full!) to dig into it yet. Here's a little sneak peek for now and we will talk about what exactly this pumpkin treat was tomorrow! 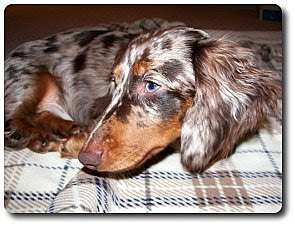 Gus is not a very happy pup today... see, he was whisked away for a little trip to the vet this morning. 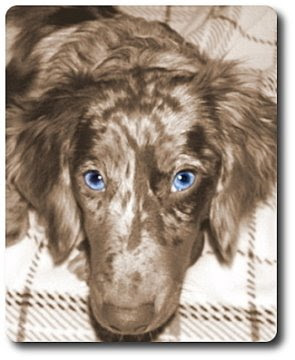 It was time he went in for his "snip snip" and when we picked him up, he used those big beautiful blue eyes of his (yes, what you see below is his natural eye color!) to let us know exactly what he thought about his little procedure! I have a feeling he's not going to let us forget about this for awhile and guilt us into several pup treats. 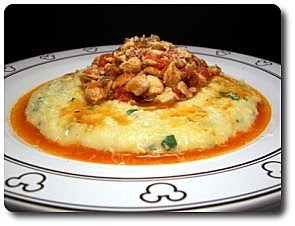 I decided to keep myself busy from his wide-eyed stares and got to work on this Chicken Ragu with Polenta that I made for our dinner tonight. For the polenta, I much prefer using coarse yellow cornmeal as I find the flavor is more defined and developed this way. It does take awhile, anywhere between 30 minutes to an hour depending on how slow you cook it, but if you don't have time for that, you can use instant polenta instead. If you haven't tried it the slow way though, I implore you to give it a try when you have some extra time so you can see for yourself - it is worth it. When the polenta was done, we dropped in a couple knobs of butter, a hefty shower of fresh grated Parmigiano-Reggiano cheese and a handful of chopped parsley to freshen up the golden mass. 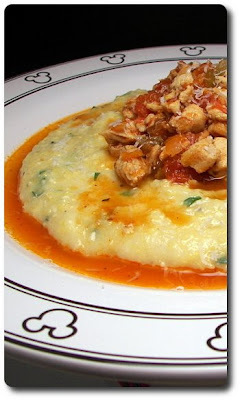 While the polenta was workin' away, I got started with the chicken ragu portion. I coarsely ground a combo of chicken breast and thigh meat to use in this dish - you could use strictly either, but we like a mix to lighten it up. I tossed the ground meat into a pot with a hot layer of olive oil and butter waiting to brown the bits up. To season, we added the obligatory salt and fresh ground black pepper, along with a spoonful or two of poultry seasoning. Once cooked through, we stirred in chopped fresh rosemary, a couple cloves worth of minced garlic, chopped onion, celery, bright shredded carrots and a bay leaf. Cooked until the onion is soft, a few tablespoons of tomato paste are added - be sure to stir this around in the pot for at least a minute to allow the rich flavor of the paste to develop. For a punch of acidity, red wine is poured in, followed by chicken stock and fire-roasted whole tomatoes. While this bubbles away and reduces, you'll want to break up the tomatoes so they are well-distributed... you can do this with a sturdy wooden spoon, but I find using a potato masher makes this job much easier. Once the sauce had reduced down, we spooned it over a flowing round of the creamy, soft polenta and added a few extra shreds of the sharp cheese on top. I ran out of time, so I probably didn't let the ragu thicken as much as it should have, but the extra juice that pooled around the edges wiggled its way into the polenta, adding extra flavor. The original recipe actually called for 2 pounds of meat with a serving size of only 4 - that is pretty darn excessive, at least for us. Even after reducing the meat to one and a half pounds, we had plenty enough for 6 good-sized servings! I'm also thinking if you have a bunch of turkey leftover from Thanksgiving, you could shred up the extra meat and toss it in here instead of using the chicken! Another edition of baking for the Weekly Wednesday Treat Day has come upon us! 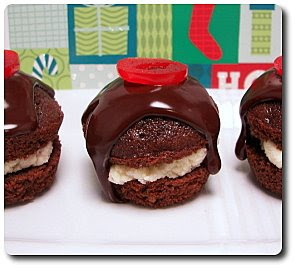 Sometimes it can be hard to nail down a recipe, but when we saw these Chocolate Cherry Brownie Bites in one of the new holiday baking magazines, I knew it wouldn't be long before I made them! 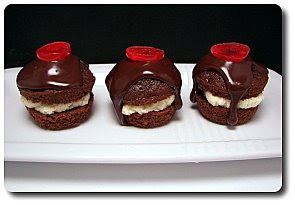 A basic brownie batter forms these chocolate-y bites - to infuse the cherries in, we folded in finely chopped maraschino cherries once the dark batter was combined. While they do bring plenty of flavor on their own, a shot of the juice they come packed in is also added to push it a little higher. The chocolate comes from using a little cocoa powder - thrown in your favorite, be it Dutch-process or natural... natural will be a touch more bitter while Dutch is smoother and delicate. Once baked and cooled, these little moist buttons are sliced in half to make room for a layer of speckled filling. Made simply by heating cream and sweet white chocolate until melted and smooth, the filling will need to hang out in the refrigerator for just under an hour. This allows it to firm up enough to be whipped, making a light, creamy ganache-like frosting. To tie in with the brownies, an additional tablespoon of the chopped ruby cherries is folded in right before slathering it between the now halved miniature treats - kind of like a small whoopie pie. If that wasn't enough already, we made another take on the filling, except this time using bold bittersweet chocolate, and letting the mixture chill just long enough so it had some staying power, but was still glossy and slightly runny. This is spooned over each bite-sized gem, allowing it to slowly drip down the sides, creating an irresistible visual treat. 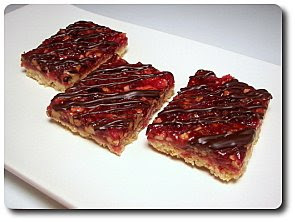 So you know exactly what you are getting, thin slices of the cherries are then laid over the pool of chocolate on top. 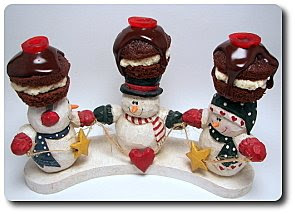 One or (if you're lucky) two-bite treats, I think these miniature cherry brownies would make a enchanting addition to any holiday tray. Since they are small, you don't need to feel guilty having one (or 3...), but they are also robust enough that one would certainly dampen any sweet craving. I know I just talked about serving potatoes with pasta... and go figure, I did it again tonight! 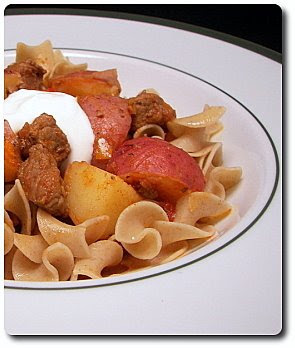 It is not necessarily a requirement for this Hungarian Gulyas dish, but it screamed, at least to us, to be served over buttered egg noodles. I should start by saying that this is another one of those recipes I can't say if it ends up being very authentic or not - either tomatoes are always added or it is sacrilege if they are put in, depending on where you are. Here's how we made it though! After starting out with a mountain of chopped onions that we softened in olive oil, we tossed in chunky cubes of lean beef stew meat. After turning the pieces, giving all the sides contact with the fiery hot bottom of the Dutch oven, we tossed in a couple cloves worth of chopped garlic and a healthy spoonful of earthy sweet Hungarian paprika. You'll probably have caramelized bits stuck to the bottom of your pan now, so to make sure those that flavor isn't lost, warm water is poured in to drag those pieces back into the stew. 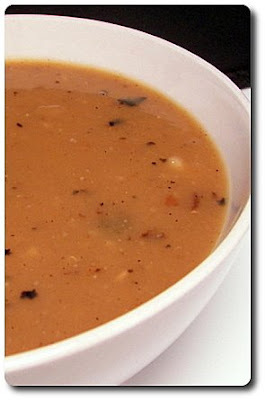 To give the beef some liquid to stew in, broth, along with distinct caraway seeds (you know, those seeds that are commonly found in rye bread), are stirred in and the mixture is left to simmer until the meat is decidedly tender. We then tossed in chopped plum tomatoes, red bell peppers and quartered new potatoes - depending on the size of your potatoes, you'll need to continue cooking this mixture until the potatoes become tender, so it could be a little more or a little less time than what we wrote down. A few minutes before the stew was done, I dropped whole-wheat egg noodles into a pot of boiling salted water, let them cook, drained them and tossed the noodles back into the pot with a pat or two of butter. 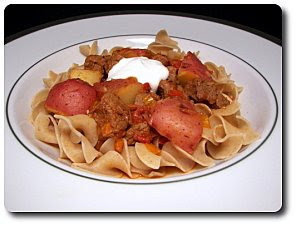 I served this dish by scooping the hearty stew over the slippery noodles - I know it doesn't look all that liquid-y in the picture, but that is a little deceiving as much of it is hiding underneath those noodles! This stew is a complete "warm you up from the inside out" kind of dish. For a little richness, we did add a dollop of sour cream on top, but it really isn't necessary (I'd do it again though!). Meaty, filling and one recipe I know I'll have on the stove when we drag ourselves in from shoveling the loads of snow I'm sure are just waiting to fall in Minnesota. One of Jeff's favorite savory indulgences is buffalo wings... and I'm sure he would say we don't have them often enough. 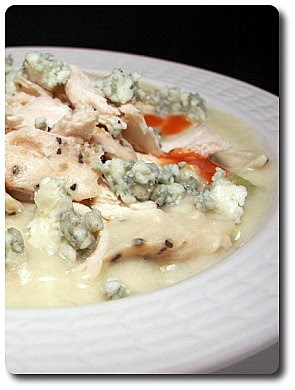 For tonight's dinner, Buffalo Chicken Soup, we took their essence and turned the components into a speedy soup! Into a pot of sizzling melted butter, we added chopped celery and onion and gave them time to soften. When the onion was tender, I stirred in chicken broth, milk for a creamy edge and a couple dashes of cayenne pepper sauce to continue the buffalo theme. When those liquids began to bubble, we gradually stirred in a mess of cheeses that we first tossed with flour. We used shreds of mozzarella, pungent crumbles of blue cheese and a handful of fresh grated Parmesan cheese for a salty depth. Once the cheese had given into the heat and melted smooth, I tossed in shredded cooked chicken that I had poached earlier in the morning while making breakfast. Don't have time to bother with that? Pick up one of those handy roasted chickens from the market and shred it to pieces. You may not use all of the meat, but toss the extra into the freezer or make a sandwich out of it the next day. When I added the chicken, I let the soup come back up to a simmer and cook for a few minutes to give the chicken a chance to thoroughly heat through. For a fun presentation, I held back on some of the shredded chicken and topped each bowl off with some of the extra, along witha few remaining crumbles of the vein-y cheese. And, while it is always optional, go ahead and put a few extra drops of cayenne pepper sauce on top - it doesn't blow your head off, but adds a punch that keeps your spoon going back for more. 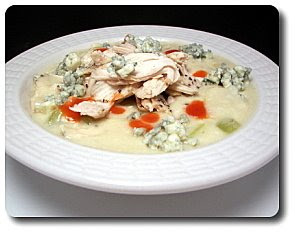 I loved the complexity the blue cheese brought to this soup... however, I've mentioned before that Jeff is not the biggest blue cheese fan in the world, especially when it stands out in a dish. He got a little worried when he saw the mound I was planning to add and started to get a little nervous - happily though, he agreed it did wonders here! 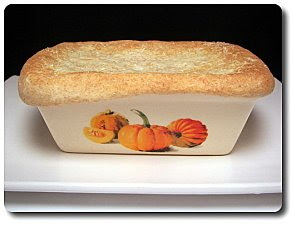 In just a few days, Thanksgiving will be upon us... are you still looking for a sweet treat to make? I have another pumpkin idea in mind for ours that we'll share later in the week, but let's take a look back at what we have made in years past. Maybe one of these will strike some inspiration? Our very first year of blogging (we lived in warm Phoenix back then!) 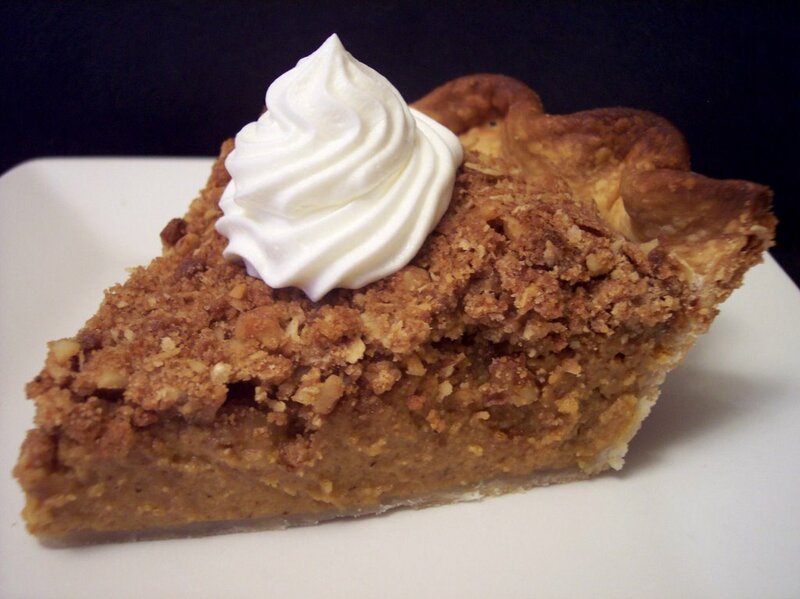 we made this Cinnamon Streusel-Topped Pumpkin Pie. 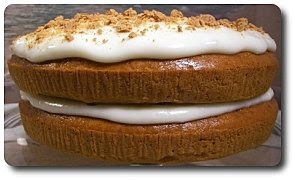 Two years ago, when we lived in Maryland, we prepared this fun Pumpkin Pie Cake. 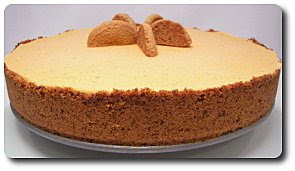 And that brings us to last year, our first back in Minnesota, when we made that Frozen Pumpkin Mousse Pie. Geez... we really get around don't we? Hee hee! Anyway, for this week we came up with 9 new recipes for us and we had a hard time picking out favorites! 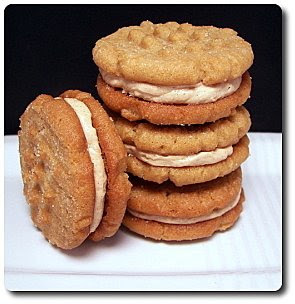 If we have to choose, I think we would pick those Peanut Butter Cream Sandwich Cookies, the Three-Cheese Chicken Penne Pasta Bake and that Smaller Batch Penuche Fudge. 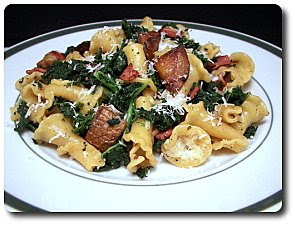 Since we love potatoes and pasta, it wasn't much of a stretch to imagine this Campanelle with Kale, Sage and Potatoes dish would go over well tonight. However, I wasn't sure if it would end up being too starchy with all those two together. Thankfully, at least for us, I had nothing to worry about! Rich in color and nutrients, kale is one of those healthy ingredients that I really need to incorporate more into our world. Since the thick stems and tough ribs need to be remove for this recipe, we needed about a full pound of the kale. However, looks can be deceiving - be sure to toss the kale onto the scale at your market... while the one we picked up looked to be enough, it weighed a paltry half pound! After grabbing another, we found one that one was close, otherwise we would have needed two bunches. Don't discard those stems and whatnot though! Save them, along with other vegetable trimmings, to make your own vegetable stock - they do leech a stronger "earthy" flavor into the stock, but we liked that when we tried it. The mound of leaves you have might look excessively large now, but once you take them for a dip in boiling water and shock them in icy cold water, you'll see they wilt right down to an embarrassing, but concentrated amount. If you know you will be running short on time when you make this, go ahead and prepare this part a day ahead of time and keep the cooked kale in the refrigerator. To get the potatoes workin', we diced up a couple Yukon golds while we waited for a pan with a slick extra-virgin oil covering the bottom to heat up. After sliding the potatoes in, we left them to cook, tossing them every so often, until they had a glorious burnished color encasing the tender, moist insides. Diced pancetta, along with pungent garlic, fresh sage and a sprinkling of crushed red pepper is added - you won't need to cook this much longer, just enough to crisp up the Italian bacon. Multitasking, we also had another pot of water coming to a boil and dropped in a couple handfuls of flower-shaped campanelle pasta while waiting on those potatoes. Not a fan of this shape? Try gemelli or fusilli. 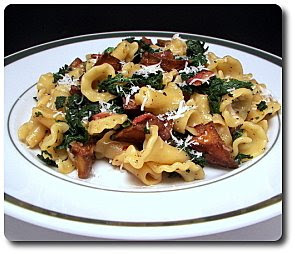 A minute or two before the pasta would have been done, we drained away the water, tossed the pasta back into the pot and added the kale leaves, golden potato mixture, chicken broth, sharp Parmesan cheese and a couple squirts worth of fresh lemon juice. A bit of the broth and juice will be soaked in by the pasta as it finishes cooking and the rest, with help from the cheese, makes a light sauce to keep everything moist. The juice added doesn't make the dish taste "lemon-y", but the acidity helped to pop the flavors. There are a few steps to this, but it goes by pretty fast and we are looking forward to heating up the leftovers for lunch tomorrow! This would also make a fine veggie dish - leave out the pancetta and swap the chicken broth for vegetable or just use the starchy pasta water instead. 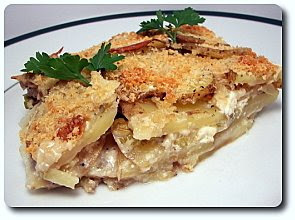 To punch up the flavor, a scattering of extra Parmesan just before serving would also be desirable. Cookies! Who can resist them? Certainly not us if you take a look at our cookie recipe section. 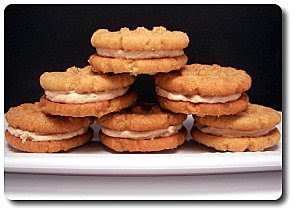 We have another one to put on that long list with these Peanut Butter Cream Sandwich Cookies I made for us a couple days ago to snack on. These two or three (if you're lucky!) 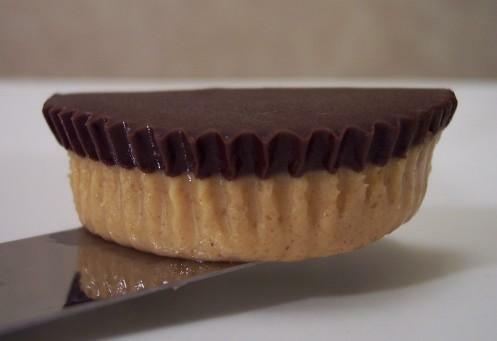 bite-sized sweet sandwiches are loaded with peanut butter - we used a creamy variety inside the dough and to add a little texture, we used chunky for the filling. The dough for these cookies is in between being sticky and dry - moist enough to hold the balls of dough together, but not so dry they fall apart when rolling smooth. To get that classic criss-cross pattern on top, the balls of dough are flattened with the tines of a fork - to help the fork release, it is dipped into shallow dish of granulated sugar before pressing the next ball. This also has the benefit of adding a little extra sparkle to each cookie once baked. 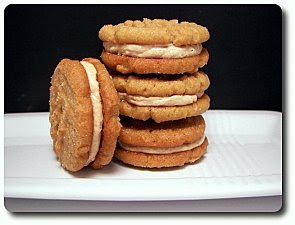 Once cooled, half of the cookies are given a dollop on their flat bottoms with a cinnamon-infused frosting. Using a mound of marshmallow fluff (creme would be acceptable), this frosting is decidedly creamy, yet the nuggets of peanuts from the chunky peanut butter add a delightful contrast. Now, I did leave an ingredient out of this filling because I couldn't wrap my mind around it - it called for adding a touch of ground cumin. I was tempted to use it, but when I asked Jeff's opinion before tossing it in - he stuck his pinky into the filling and responded with "this is already good enough - please don't ruin my cookies!". Oh well... I should have just kept quiet! So, if you're feeling a little adventurous, toss in a quarter teaspoon of the smoky spice and let us know if he was wrong! The first day, the cookies were crisp, but still had a lovely give to them. After sitting a day or so, they absorbed some of their centers' moisture and softened slightly - I think we both actually preferred them that way as the nutty filling tended to squish out when top and bottoms were more crisp. Dainty, but assuredly addictive, I was planning on giving a plate of these away, but I was vetoed out of that idea and the few that are left have been stashed away for a speedy treat down the road. While some may argue tonight's Friday Night Pizza isn't really a pizza, I won't mind as these Pizza Pot Pies were quite fun! For the quick homemade sauce, a can of fire-roasted crushed tomatoes is perked up by warming garlic, fresh aromatic rosemary and diced pancetta. When the pancetta had a chance to crisp from the heat in the saucepan, the tomatoes are added, along with a few crushed red pepper flakes, and are left to gently simmer and concentrate the tomato's flavor. 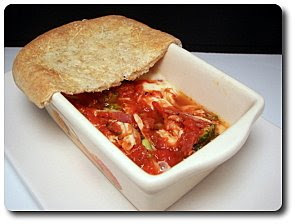 Now that you have a basic, but zesty sauce, shredded cooked chicken is stirred in, along with chopped broccoli florets and chunky pieces of mozzarella cheese. This juicy combo is divided between six ramekins - use round ones if you want, but we had these festive miniature ceramic holiday loaf pans and they had enough room to hold the filling. To make these pot pies, we now need a topping. Instead of a pie crust or biscuit type covering, we prepared our favorite whole-wheat pizza dough, stretched it out and sliced pieces to fit our ramekins with enough extra to hang down the sides. To help give the tops a bit of color as they bake in the oven, we brushed each crust with just a little olive oil. This also adds some sticking power for the fresh grated shreds of Parmesan cheese we sprinkled on top. If desired, you can certainly add or subtract the filling ingredients to your taste - take out the chicken and toss in some crumbled Italian sausage or sautéed mushrooms if that sounds good to you. While you could steam the broccoli before hand, adding the tight florets raw will let them retain some texture after being cooked in the sauce. I did comment to Jeff that the sauce seemed a touch too liquid-y once it was baked, so I would think about maybe stirring a spoonful of tomato paste into the sauce, before adding the tomatoes, to give the sauce some body. Remember when I told you that we have started making monthly treats to send to Jeff's niece as our graduation present now that she is attending college? The first treat we made were those Outrageous Oreo Brownies that are always a hit... the second were one of Jeff's favorite cookies, those Chocolate Malted M&M Cookies. 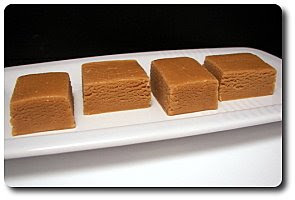 We sent off another package and this time we made fudge, Smaller Batch Penuche Fudge in fact! I know homemade fudge can seem a little daunting with candy thermometers and all, but I've made this three times now and it seems like a pretty snazzy technique that isn't too tough! 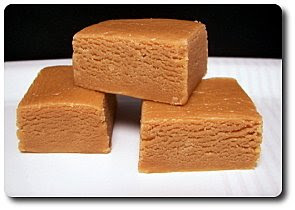 Penuche fudge is basically a vanilla fudge, except it has decadent caramel tones because it is made with brown sugar instead of granulated. Evaporated milk, brown sugar, a few chunks of butter and a pinch of salt are brought to a boil to form a bubbly golden pool that is left to simmer until it reaches the desired temperature (in this case, 236 degrees - soft ball stage). This will take several minutes as you want this to happen slowly - use medium-low heat... however, if the temperature does not seem to be creeping up, increase the heat slightly (try not to go higher than medium) until it starts to move again. The now very hot candy mixture is poured into a mixing bowl with a scoop of powdery confectioners' sugar added. Rather than letting the mixture cool and beating with a wooden spoon (as many recipes call for), this one has you beat it with a mixer until it thickens and smooths out. When that happens, a splash of vanilla is added - now would also be the time to toss in a cup of toasted nuts, if you want a nutty fudge, but Jeff is darn picky about nuts in his fudge! This makes just enough to pour into a loaf pan without the resulting pieces being too thick. 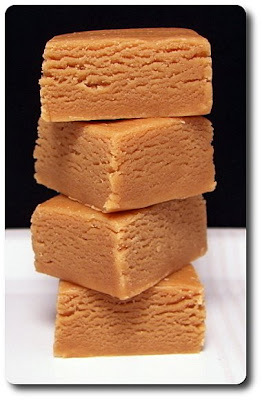 Velvety smooth, rich and sweet, without being tooth-achingly so, each time we made this I didn't have any issues with grainy fudge or any other candy making disasters. Getting the sugar mixture up to the proper temperature is key for this to set up correctly - if you are unsure about your candy thermometer, you can check it by putting it in a pan of boiling water to see what it reads. Water boils at 212 degrees, so if your water is boiling and your thermometer reads 202 degrees, adjust the recipe accordingly. We use a handy digital one, but I do keep another kind on hand just in case. Now, back to making it three times. Before sending out the first batch, we had to try a few pieces to make sure they turned out well... surely, you would do the same, no? So... maybe we actually sent out the second batch because we ate all of the first. Oops! It is "Smaller Batch" after all! The third? We decided to make a surprise Friday Treat Day last week and I had Jeff bring some into the office to share. I knew tonight's main dish for dinner was going to be pretty filling, so I searched through the salad section of our to-try recipe piles to see if anything sounded good. I had an open container of dried figs that needed some attention, so when I saw them called for in this Arugula Salad with Goat Cheese, Bacon, and Balsamic-Fig Dressing, I snatched it out. Tangy and sweet, the dressing for this salad is definitely the star. To create the dressing, dark balsamic vinegar and chopped Black Mission figs are heated together until the vinegar boils - the pot is then covered, taken off the heat and then set aside to let the figs stew. Those two, along with a bit of water, broth, a couple tablespoons of extra-virgin olive oil, a squirt of sticky honey, mild shallots and a (literal) pinch of fresh thyme are blitzed in a food processor (a blender would work too) to smooth out the figs, giving the dressing a robust texture. 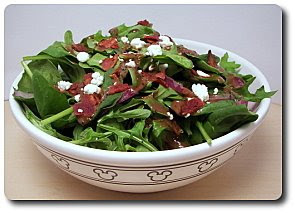 For the greens, we used a combination of bitter arugula and tender leaves of baby spinach - we tend to gravitate to that combo, but you can certainly use all arugula. 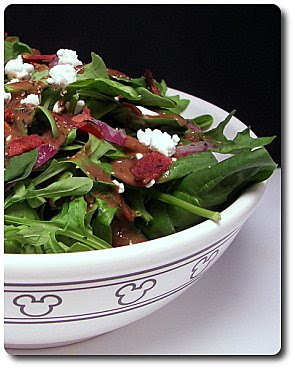 Since the dressing is fairly heavy and thick, we portioned the greens out onto the plates and added some sliced red onion, rather than tossing all of the salad ingredients together in a bowl, weighing down the delicate greens. We drizzled the dressing over the top, sprinkled over crisp crumbles of salty bacon and topped it off with a few nuggets of creamy goat cheese. There was not a speck left on our plates when we finished this salad! Good enough as is, I bet a few toasted pine nuts would be a pleasant addition, bringing a textural crunch to this exquisite salad. The other dish I made tonight, Potato-Goat Cheese Gratin, is more likely to be served as side, but as we are potato fiends, we just made the portions bigger! There is a surprise layer in the middle of the sliced buttery Yukon Gold potatoes. Inside is a blanket of softened leeks that we slowly cooked until the mild onion-y strips began to caramelize. So the goat cheese would stay moist, a cups worth is scattered with those leeks and hidden underneath another layer of potatoes. Those potatoes should be sliced about 1/8" thick - if you have a food processor, use the 4mm slicing disc to make very short work of them. A mandolin would also help quicken the preparation, but if nothing else, use your trusty sharp knife and try to get the pieces roughly the same size. Before the second layer of potatoes was laid on top, we poured over a combination of milk, flour, fresh grated nutmeg and a clove worth of minced garlic. 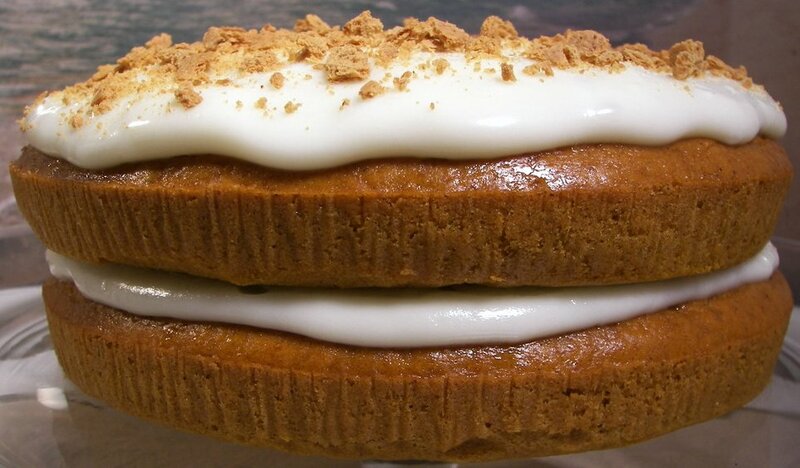 You'll only want to add about half this time as the rest will be poured over the final layer. Once the dish is covered and put in the oven, it will take quite a long time to bake... so grab a glass of your favorite drink and set a timer so you don't forget about them! About halfway through, the cover is lifted and the layers of potatoes continue to cook until the liquid begins to thicken and the potatoes can be easily pierced with a knife. When they test done, the potatoes are given a shower in coarse panko breadcrumbs that we tossed with Parmesan cheese and are left for a few more minutes, letting that topping crisp up and brown. Ready for a rough baking time? An hour and 25 minutes, plus you'll want to let them sit about 10 minutes after being pulled from the oven. Eek... so we finished dinner a little late as it was definitely pushing it as a weeknight meal for us. We portioned this out into four servings as a main dish, but it could definitely stretch up to 8 as a side. The potatoes were tender enough to easily slice into rectangles, but still had a firm enough texture so they didn't turn into mashed potatoes when eating. That little touch of nutmeg doesn't come through as "why is there nutmeg in my potatoes? ", but adds just an inkling of spice that made this extra special. I was intrigued by how much we both loved how the pleasant, creamy surprise the goat cheese added - I'll have to remember that trick the next time we make a layered potato dish! Can you believe it is time again for bouncy fresh cranberries? With such a short stint in the market, we always make sure to stock plenty in the freezer so we can use them all year round. 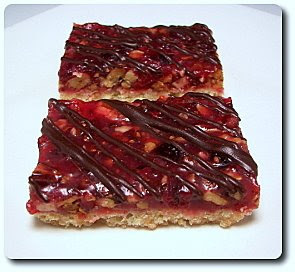 Besides the ones we picked up to stash in the freezer, I also grabbed an extra bag so I could make these Cranberry Turtle Bars for the Weekly Wednesday Treat Day item! 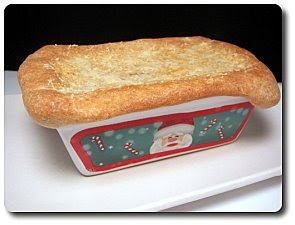 I hope you are not afraid of using butter - remember the picture we showed you for our holiday supply? Well, subtract almost 4 sticks for just this recipe! To prepare the sturdy base for these bars, we made a snazzy brown sugar shortbread (a.k.a heavy on the butter cookie dough!). While we whizzed this shortbread together in a food processor to move things along, you can certainly use a pastry blender, a couple knives or even your fingers to mash the cubes of cold butter into the flour and brown sugar mixture. You'll have a very crumbly dough at this point that just barely holds together - we then scattered those crumbles into the baking pan and pressed them down to form an even layer. Now, because the rest of these bars are prepared on top of the stove, the crust will need to be pre-cooked - bake it long enough that the top turns from pale to golden, fusing the crust together, and the center is just firm to the touch. While the crust cools, a couple more sticks of butter are melted to begin creating the ruby caramel topping. Grains of white sugar, clear corn syrup and a pinch of salt are stirred in and left to boil until the mixture is brought to the soft ball stage. When it came up to temperature, chopped fresh cranberries are stirred in (frozen would be okay too... don't bother thawing them first), which will make the temperature in the pan plummet. Then you'll need to bring the mixture back up to the same stage again so it will properly set as it cools. Now you need to stir in a shot of vanilla - when you do this, do be careful as the alcohol will turn the mixture angry, making it spurt and fizz. 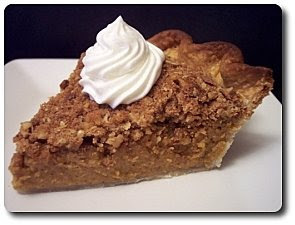 A generous amount of chopped toasted pecans are stirred in and working quickly, but safely, the sticky topping is poured all over the buttery crust. Since it is pretty thick, it won't flow to an even layer when you pour it on - to help solve this, just use a couple forks to help distribute the soften cranberries and nutty pecans. 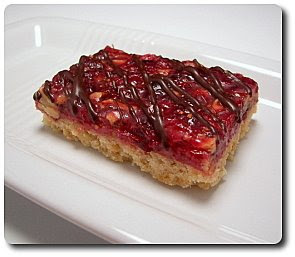 Let's not kid around, there is quite a bit of sugar in these bars and they are quite sweet - but between the rich base and the tart cranberries, it is somewhat corralled. To off-set the sweetness even more, give it a fancy look and well, just because, melted bittersweet chocolate is drizzled back and forth over the slab of bars so each piece gets a share. 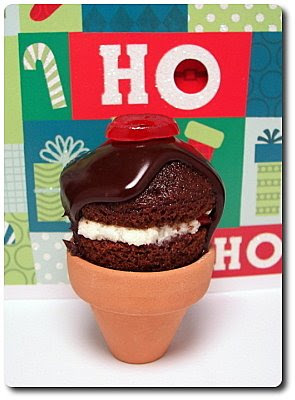 The drizzle is easiest done if you scoop the melted chocolate in a zip-loc bag or parchment cone, but using a fork or spoon would be just fine too. After preparing those decadent treats, and subsequently taste-testing, I made sure to plan ahead for a light dinner. Along with being pretty light, this Southwestern Cheese Panini was also a snap to throw together in our now messy kitchen! We used a hearty whole-wheat sandwich bread for these panini's - to help them brown, we smeared a very light coat of softened butter on the outside of each slice. 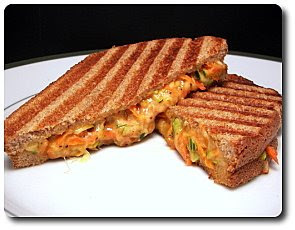 On top of the unbuttered sides of two pieces, we stacked on the veggie and cheese filling consisting of shredded zucchini, shredded carrot, finely chopped onion and sharp white Cheddar. To help hold that mixture together, and add that southwestern flare, we also added a few dollops of salsa - let your heat preference guide you as to what you use. We like a fair amount of burn, so we made sure to use a habanero salsa. We also added a little pickled jalapeño, but didn't really notice it in the end, so I imagine you can leave that out if you like. After just a few minutes in our heated press, we made quick work of these sandwiches - I didn't know if Jeff would like the zucchini, especially after the first bite and the "umm, why is there zucchini in my panini?! ", but then he continued to sink his teeth in and under his breath said that these were quite actually addicting! I have to agree too - I loved the sharp contrast from the gooey cheese to the earthy vegetables, while the punch from the salsa seemed to anchor those two together. If you happen to be serving to a vegetable-phobe, try using a yellow cheddar instead to help hide what is actually inside! 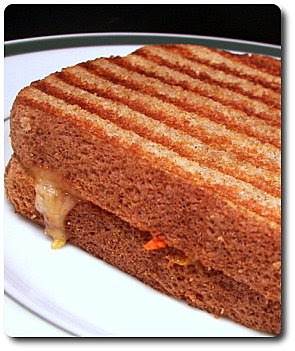 As I said, we used our panini press (the ever-handy Griddler!) to cook these sandwiches - however, if you don't happen to have one, you can still prepare this. Instead of the press, heat up a skillet with just a little canola oil on the bottom - slip the sandwiches into the skillet, set a plate on top and weigh them down with a couple heavy cans. Turn the sandwiches over after a couple minutes and place the plate and cans on top again so the bread has full contact with the heat to finishing browning. Dogs in the snow... plus pudding!